The sun is just starting to cast its shadow on the water as the glass bottom boat sails away from King's Wharf, where the Norwegian Dawn is docked. It is a beautiful night as we sail past several little islands that collectively make up the Bermuda Islands. We sail past beautiful beaches with umbrellas still open. Gorgeous homes, worth several millions of dollars, are seen along the banks as the glass bottom boat makes its way to the site of the Vixen shipwreck. The time from leaving the pier until we arrive at the site of the shipwreck is sufficient for the crew to explain what we are about to see. One might think that a "glass bottom boat" would be made completely of glass and that you could see the water the entire time. That of course isn't the case. At the speed we are currently going, there wouldn't be anything to see, so the glass bottom viewing area remains closed until shortly before arriving at our destination. The boat slows down as we approach the reef near the resting place of the shipwreck Vixen. We've just entered the world of the fish once again, and this time we aren't even getting wet. We gather around railings which are put up around the glass bottom viewing areas. There are several locations, so everyone is easily able to gather around one of the openings to peer into the waters below. The boat circles around the reef so that everyone is able to view the fish and marine life below. Seeing the fish though the glass bottom is OK, but not as good as the view we were about to get. The crew had a supply of day-old bread with them. We were each given a supply and instructed to throw the bread overboard. A school of fish immediately surfaced and began feeding on the slices of bread. It wasn't even necessary to break the bread up - they would do that themselves. It was amazing to see these large fish fighting each other over the bread. The captain then moved further out from the reef and once again a crew member threw some bread overboard. To our amazement, no fish retrieved the bread. The fish have been trained over time that it is safe near the shipwreck since fishing is not allowed. However, once outside the boundaries, all bets are off and they know they could be caught. This tour was enjoyable. There are several tours offered throughout the day. We had decided to do the early evening excursion. I suggest taking this or similar tour so that you see Bermuda from the water. If you don't want to take an organized tour, at least take a ferry to either Hamilton or St. George so that you see Bermuda from this perspective. Next time, we'll continue with more attractions. I think you should be starting to get the idea that there's many choices in Bermuda. There is definitely no reason to be bored on this cruise. Since we had gotten an earlier ferry to St. George, which saved us time getting to the Crystal & Fantasy Caves, we had some extra time in our schedule. We planned to spend the morning and early part of the afternoon in Hamilton. 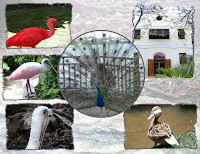 The Bermuda Aquarium, Museum and Zoo (BAMZ) can easily be reached by bus #10 or #11 from the Hamilton area. We walked out the entrance way of the caves and weren't sure which way to go to catch the bus. We stopped at the entrance trying to get our bearings and a taxi driver asked where we were trying to go. We told him where we were headed and that we were looking for the bus. He said we could catch the bus right around the corner. We walked down the street and found the bus stop. You'll recognize them pretty easily once you see them. They are cement structures with a bench. They can also be a blue metal post. A bus came within a few minutes. Our timing all day was very good (catching the ferry, then the bus to the caves, and now the bus to the aquarium). Boarding the bus, we showed the driver our passes and asked to be told when we got to the aquarium. It only took 10 minutes or so to get there. The bus stops right in front of the building. As you can see, it is pretty easy to get around Bermuda. What makes it even easier are the people. We've been all over the world and I don't think we've found more helpful or friendly people than we did in Bermuda. When we asked someone where some attraction was, they would stop what they were doing and give specific directions. In many cases, they practically took us to where we wanted to go. The people really made the trip to Bermuda enjoyable. The admission to the BAMZ is $10 per adult. 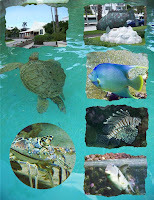 It is not a large facility, but it is a worthwhile attraction, especially for anyone that loves seeing fish. There's a Discovery Room where children of all ages can gently handle sea urchins, sea stars and sea cucumbers, along with conch, sponges, chitons and other marine creatures. There are over 200 species of fish and marine life in the various displays. The angel fish, octopus, eels, and spiny lobster were our favorites. After we completed the indoor aquarium exhibits, we went outside to the zoo portion of the facility. Since it was past lunch time, we decided to get sandwiches in the outdoor cafe. There wasn't much of a selection, but it met our needs. We completed our lunch and continued our self-guided tour of the BAMZ. A peacock greeted us and joined us as we walked along the path. It would later spread it's feathers for the photograph above. There were several species of birds and animals including Parma wallabies, tree kangaroos, and Asian small-clawed otters. A pleasant surprise was a Galapagos turtle. Our next planned cruise is to Galapagos Islands, so this gave us a glimpse into our future. Our goal was to catch the 2:30 ferry back to the Dockyards, so we bid farewell to the BAMZ and headed for the bus stop. We didn't have to wait long for the bus. This time the bus was pretty crowded and we had to stand. Make sure to hang on tightly if you ever stand on a bus in Bermuda so you don't end up in the driver's lap. The bus ended at the Hamilton terminal. We asked a pedestrian for directions to the ferry (it was only a couple blocks away). Once again our timing was excellent - the 2:30 ferry was about to depart fo the Dockyards. We'll look at other Bermuda attractions in my next posts, so be sure to check back for updates. 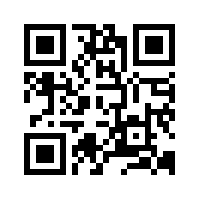 Here's a link to some pictures from the Aquarium visit. The Crystal & Fantasy Caves of Bermuda topped our "must see" list as we left for our 7 Night Bermuda Cruise on the Norwegian Dawn. This attraction is accessible from either Hamilton or St. George, Bermuda. After arriving in King's Wharf (Dockyards), we disembarked the ship and stopped at the Tourist Information booth at the pier. We purchased 3 day passes for the Sea Express Ferry and Public Buses. The cost for the 3 day pass was $28 each. We weren't sure if we'd need the pass for all 3 days, but decided that if we didn't want to walk in Hamilton, we'd be glad we purchased it ahead of time. The attendant told us where to board the ferry (across from the Bone Fish Bar & Grill) and we headed that direction. Upon our arrival there were two ferries boarding. One ferry was headed to Hamilton and the other to St. George. Originally we had planned to take the ferry to Hamilton, but after talking to the attendant at the ferry, we decided to take the St. George ferry instead. It would be a shorter bus ride to the caves from there (only about 10 minutes instead of 45 minutes to an hour from Hamilton). Arriving in St. Geroge about 30 minutes later, we discovered that there were two other NCL ships in Bermuda. Due to the large number of tourists in town, the bus company had put extra buses into service. We walked from the ferry dock down the street about a block and boarded one of the special buses to the caves. 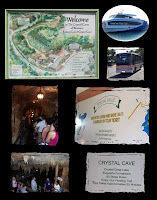 Upon arrival at the caves, we purchased the combo ticket for both Crystal and Fantasy caves. Each cave takes approximately 30 minutes to tour. It is worth seeing both of the caves. Let's turn back the clock to 1884 when the Wilkinson family, owners of the property, learned about the cave. They immediately set about exploring the cave (which is known as Crystal Cave today). Their fourteen year old son, Bernard, crawled through a small hole with only a bicycle lamp. He had 140 feet of rope tied to a tree as his only life line. It was dark, damp, and cold. He could only see a few feet in front of him as he carefully crawled through the cave. (Resetting the clock to today) You enter the same cave, but today you enter through a doorway. A cement stairway with a guardrail replaces the dirt path that Bernard used. Electrical lights light the path instead of relying on a bicycle lamp. It's a little damp and cool, but you are quite comfortable in your t-shirt and shorts. You walk along the pathway and are surrounded by stalactites hanging down from the ceiling of the cave. The tour guide turns off the lights for a few minutes (after warning us). We can now imagine what Bernard saw when he crawled into the cave. Taking pictures with your flash in the total darkness produces fantastic photos. 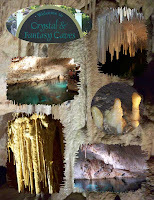 (click this link for our Crystal Caves photos and this link for our Fantasy Caves photos). We retrace our steps and exit the Crystal Cave. Our new guide greets us and directs us to the entrance of the Fantasy Caves. There is a steep staircase that descends to the floor of the cave. For safety reasons, our guide asks us not to take any pictures until we are all safely at the bottom of the staircase. Fantasy Cave is very similar to Crystal Cave, however it's the interesting shapes that makes it unique. One can use their imagination to "see" various shapes in the stalactites and stalagmites. If you've seen Pirates of the Caribbean, you might notice a familiar shape in the second collage above. Another thing that makes Fantasy Cave different is the various colored lighting that accentuates the various shapes in the cave. We made our way to the rear of the cave. Since there isn't a lot of room in some spots, only a few people continue at a time. The guide repeats his narrative as often as needed to be sure everyone hears about the various fantasy shapes. Once again the lights are turned off for the full dramatic experience of the cave. We were certainly glad that this was our first stop in Bermuda. We would not have wanted to attempt this on the Hamilton port day. There was still plenty of time for other sightseeing following our visit to the caves. In my next post, I'll continue with some other attractions. I've talked about Freestyle Dining before, but in case you have forgotten, NCL is the only cruise line that offers up to 13 different restaurants on board a single ship. You can dine where you want and select from Steak, sushi, Teppanyaki, tapas, French, Mediterranean, Asian Fusion, Italian, Tex-Mex, buffets, pizza. In addition, you can dine when you want from 5:30 PM to midnight with seating until 10:00 PM. You have the option to decide last minute or make reservations 24 hours in advance. Certain cabin categories allow you to make reservations further in advance. You'll be seated at a table for 10 with a large cooking area surrounding you. The waitress takes your drink order and brings you a salad. While you are eating your salad you decide what you want to eat. Choose from Chicken, Jumbo Shrimp, Filet Mignon, Lobster, Calamari, Scallops or various combinations of these items. Next you'll be given your cup of soup along with various dipping sauces for your meal. The fun is about to begin as the chefs enter the room. Knives and other cooking utensils are tapped on the cooking service or twirled as the show unfolds before your eyes. The chef begins by making a vegetable appetizer for the entire table. Items like onions, squash, carrots, peppers are sliced and cooked. He divides the food into individual servings and moves onto the next dish. More acrobatics as he makes fried rice with scrambled eggs and all the trimmings. Of course he doesn't simply crack the egg, anyone can do that. How about catching the egg in his chefs hat and then cracking it open after that. Who knows what your chef might do to entertain you. Every dinner could be entirely different. They thrive on your involvement and really seem to enjoy their "work". After verifying each dinner entree order, the main cooking begins. Our table had a mixture of chicken, shrimp, steak, and lobster. Each meal is cooked to order as you continue eating the vegetables and fried rice. If you had a combination meal, such as shrimp and steak, the chef will prepare part of your meal and place it on your plate while continuing to cook the rest of the food. When everyone has received their complete meal, the chef bids farewell with some flare as before, to the applause of an appreciative audience. The waitress reappears to clean up and to settle your bill (there is an extra gratuity for this freestyle venue). Since you have been entertained, I would say that they earn the gratuity in this case. We enjoyed our meal at Teppanyaki. 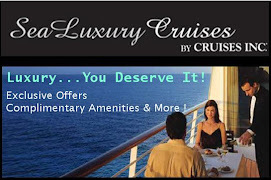 The choice is yours on your cruise. Since, as NCL says, you are free to whatever - that includes dining with whom you want, where you want, and when you want (obviously within limits). Next time, I'll start discussing the various attractions we visited in Bermuda. Evenings aboard the Norwegian Dawn typically included dinner at one of the Freestyle Dining choices and entertainment. The first night, there was a Welcome Aboard Show in the Stardust Showroom. The main attraction for this show was the Jean Ann Ryan Company with music provided by the Norwegian Dawn Showband. Since photography was not allowed during the show, close your eyes and imagine you are seeing singers and dancers perform live onstage. Since we had eaten at the Welcome Aboard BBQ, we didn't go to one of the restaraunts the first night. We did join romantics and photographers out on deck for a glimpse of the setting sun. As the saying goes, "red skies at night, sailors delight". Tomorrow would be a beautiful day if the saying held true. As the sun sunk lower from the sky into the sea, we bid our goodbyes to New York (or at least that's what we thought). While we were waiting for the show to begin , the Captain interrupted to announce that our ship was turning back to New York due to a medical emergency onboard. One of the passengers had been injured and required medical attention. Since the next two days were sea days, this would not impact the overall cruise schedule. For those that wanted to dance the night away, Spinnaker Lounge was the site of the Welcome Aboard Party: Dancing Through the Decades. The Cruise Director Staff and Sound Bytes hosted this dance party featuring the greatest dance hits from the 50's to today. On Tuesday night the lounge was the site for 70's Night Disco Groove party. Members from Second City Comedy Troop were also onboard and Thursday and Friday the Spinnaker Lounge was turned into a comedy theatre for their show. Music could be heard throughout the ship. The venues also included Gatsby's Lounge, Grand Attrium, Dazzles Lounge, and Pearly King's Pub. There was something for every music taste throughout the cruise. You could even be one of the "stars" at the Family Karaoke which was held in Dazzles Lounge a few times during the week. Dawn Club Casino opened about an hour after we left New York and remained open the first night until the ship returned to New York to have the Coast Guard transport the injured passenger. The highlight event in the casino was on Monday night for Monte Carlo Night. This event was hosted by the entertaining Gazillionare (the Cruise Director) along with the Freestyle Showgirls and Monte Carlo Night Tumblers. The casino was open except while we were in port. Although Norwegian Dawn doesn't have a formal dress code during the cruise, some people dressed up on Monday night and had their picture taken with Captain Trygve Vorren. There were opportunities other nights for pictures if you were so inclined. In fact, even if you didn't want your picture taken, you probably had more than your share throughout the cruise. In my next post, I'll talk about a couple of the Freestyle Dining options that we did during this cruise. These events only scratched the surface of the evening's choices. As NCL said in the Freestyle Daily, "everything is hotter when the sun goes down". The sun shines into your cabin, you stretch, and decide to get out of bed. There is no rush after all since this is a sea day. 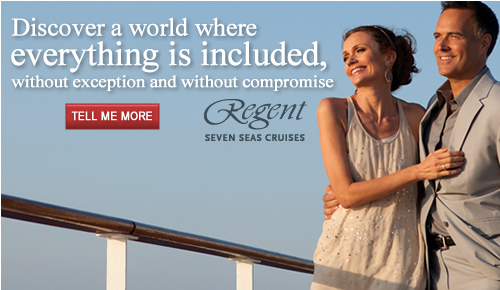 As NCL's commercials say "You are free to whatever". There are no set dining times, so you can have breakfast, lunch, and dinner any time you want (or skip any of the meals completely). I'll discuss the various dining venues in other posts. For the morning people ... There are various fitness activities planned for the first sea day including Early Morning Stretch, Fab Abs, Pathway to Yoga, and of course, your own workout in the fitness center. For the competitive families, there's the Father & Son Baketball Tourney with the Sport Staff or Tiny Tots Baseball. Pehaps you want to learn more about Bermuda and the things to do. 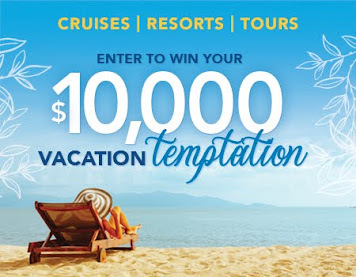 If so, don't miss the Shore Excursion Presentation and/or the NCL "U" - Destination Bermuda. If you are into gaming, there's Free Gaming Lessons in the morning and a Blackjack Tournament and a No Limit Texas Hold'Em Tournament in the afternoon or you can just try your luck in the Casino. Of course, don't forget about Bingo and Ships Lotto. In the afternoon ... partake in one of the enrichment activities including an Art Auction, and NCL "U" sessions - Italian Wine Tasting, The Art of Making Sushi and Sake Tasting, Humor: Second City Before They Were Stars, Martini Tasting, or Beers of Europe Tasting. The "tasting" sessions have a $15 fee. There are several spa and fitness seminars to chose from. There are more sports tournaments: Teen Hockey Tourney, Teen Soccer Tourney, Adult Only Volleyball Tourney, and Open Sports Play with the Sports Staff. You can even play Goofy Golf Putting with the Cruise Director's Staff. The Cruise Director's Staff hosts various activities including Shuffleboard Tournament, Weakest Link Game Show, Win Lose or Draw, and Wii Tennis Tournament. There's musical entertainment, movies, trivia, and much more to choose from. Or you can simply camp out on a lounge chair by the pool or read a good book in your favorite hide-away onboard the Dawn. This is just a sample of the many activities onbord the NCL Dawn. You shouldn't be bored - there is something for everyone. So, go ahead and do whatever. A feeling of peace surrounds you as you walk into the El Dorado Spa lobby aboard the Norwegian Dawn. You immediately forget that you are even on a cruise ship since you are surrounded by tropical plants and warm colors that relax your mind and body. The therapist behind the desk asks if they can help you. Since you have signed up for use of the spa area for the entire cruise, you give them your cabin card and in exchange receive a robe and a locker key. A few minutes later you exit the changing room and enter into the pool area. After putting your robe, towel, and shoes by one of the lounge chairs, you decide to go for a swim in the warm waters of the pool. The water is very comforting. The spa isn't very crowded, so you have the pool to yourself. As you start to do some laps, you can't help but think about how much nicer it is having this pool to yourself instead of competing with everyone else in the main pool area. After doing laps for awahile you decided to go into the thalassotherapy pool. The water is much warmer than the pool. The warm seawater circulates around your entire body and you find yourself relaxing like you've never done before. Thalassotherapy is a rediscovered spa treatment based on an ancient belief in the natural healing properties of seawater. The word itself was coined in 19th Century France from the Greek "thalassa" meaning sea and "therapeia" meaning healing. Today, thalassotherapy is used as an alternative treatment for medical conditions and has become a popular tourist attraction for relaxation and stress reduction as well as a favorite method of anti-aging healing by maintaining healthy circulation in the body. After relaxing awhile in the thalassotherapy pool, you decide to go into the hot tub. There are a couple people in there already and you strike up a conversation. They too are having a wonderful time relaxing in the spa. Isn't this heaven? When the timer for the jets goes off, you decide you'll just relax on your lounge chair. Your chair faces the aft of the ship and you watch the wake of the ship as the ship sails away in the calm sea. The sun is starting to set. You've had a wonderful time and are feeling very relaxed. It's almost time to get ready for your evening activities, so you go take a shower and retrieve you belongings from the locker. You'll be back another time since you've got a cruise pass for the entire length of the voyage. What a great way to end the day. Your day began with your Hot Stones (aromastone therapy) massage appointment. For 50 minutes, your therapist worked every kink out of your body using her hands, massage oil, and hot stones to relieve stress and muscle aches. I hope you enjoyed your first sea day with visits to the spa. In my next post, I'll talk about some of the other things that were going on the first two sea days. When we awoke the sky was a bit threatening, but the sun came out and burned the clouds away leaving a beautiful blue sky with billowy, puffy white clouds. The New York City skyline is magnificent especially when it is framed by clouds. The railings along the pool-side decks were lined with passengers as we sailed past the NYC skyline on the port side and New Jersey on the starboard side. Off in the distance, on the starboard side stood the Statue of Liberty, torch reaching into the blue sky. The highlight of the sail-away was sailing close to the statue as we headed out to open sea. ago. That time, the sun was just rising and the torch really glowed in the morning light. Perhaps a more striking image was that on that past cruise, the World Trade Center buildings were still standing and they too were glistening in the morning light. On that day in September, 2001, the New York skyline was changed forever, but through it all, the Statue of Liberty still stood fast in the harbor with her torch lighting the way to freedom for so many people that have come before us, and those that will follow. How fitting that we had visited Ground Zero on this trip so that we were now reminded about what the Statue of Liberty reall means to all of us. After passing the Statue, the crowded thinned out and the party kicked into full gear. The band played on the stage by the pool and the BBQ was ready to be served. The menu consisted of hamburgers, hot dogs, and chicken along with all the trimmings. Since we hadn't had any food when we first got onboard, we were starting to get hungry, so we decided to partake in the BBQ. There's nothing like good old outdoor cooking - and to think it wasn't in our backyard, but on a cruise ship. We'd actually have BBQ lunches several times throughout the cruise, since we spent some of our free-time poolside. The cruise was officially started; we looked back in the distance and saw the New York City skyline fade away. In my next post, I'll take you inside the El Dorado Spa for a closer look. 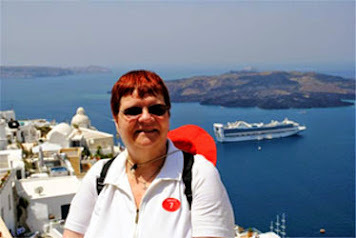 We arrived at the pier around 11:30 AM, checked our baggage with the porters, and entered the cruise terminal to check in. As usual, we had done our pre-cruise paperwork which makes life so much easier when you arrive at the pier. The only documentation we needed was our cruise ticket and passports. The embarkation process went quite smoothly. There were separate lines for Latitudes (NCL loyalty program) guests, Balcony cabins, and other higher category cabins. When we arrived the special lines were short and the regular lines seemed to be moving pretty well. I didn't hear any guests complaining about the embarkation during the cruise, so I'll have to assume most people had no problems with the boarding process. Once onboard we were greeted with a glass of champagne and told that the cabins weren't ready yet. One of the stewards took our carry-on bags and escorted us to a lounge where they were storing bags until the cabins were ready. After dropping off our bags, we headed off to explore the ship. My husband and son wandered off to take a few pictures of the atrium area while I waited in line to make dinner reservations for the first sea day night. When we had been on the Pearl, we hadn't made a reservation for Teppanyaki restaurant and I wanted to be sure we'd get there on this trip. I made the reservation for Monday at 6:30 PM and then joined the rest of the family to continue our exploration. One of our first stops is always at the spa to see what is offered, and to make our appointments so that we get our first choices. One of the therapists was demonstrating the Aromastone therapy, which is my favorite treatment. She gave all of us a taste of the treatment and we then made our appointments for the first sea day. 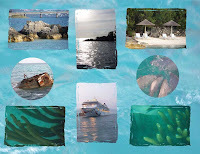 We also purchased the cruise pass for the relaxation area which included a thalassotherapy pool. The spa warrants a separate post, so stay tuned for more details. After leaving the spa, we headed to Spinnaker Lounge to relax for awhile before the mandatory lifeboat drill. As you can see in this picture, we decided to take advantage of one of the unique chairs in the lounge. A passing couple just had to take our picture because we looked so comfortable (which we were). You'll notice that I've not mentioned food at all yet. Yes, there was the usual welcome aboard buffet in the Garden Cafe, but since we had had a buffet breakfast at our hotel, we weren't quite ready to eat at this point in time. We left Spinnaker Lounge, picked up our carry-on bags and headed to our cabin. A couple of our suitcases arrived shortly after that, so we unpacked a little before heading out again. The cruise was off to a good start and we were getting into the swing of things. In my next post, I'll talk about the sail-away party which included Statue of Liberty viewing and a cookout on deck. Our 7 night cruise to Bermuda on Norwegian Dawn sailed from the Manhattan Cruise Terminal in New York. As usual, we arrived the day before the cruise and stayed at the New York LaGuardia Airport Marriott Hotel. We chose this hotel due to the proximity to the cruise port and also because it offered a shuttle service to and from the airport and the hotel. After claiming our luggage, we called the hotel and arranged for the shuttle to pick us up outside the baggage claim area. The weather was quite warm with overcast skies. At first we debated about venturing out from our hotel at all, but after talking with the Bell Captain at the hotel, who encouraged us to complete our original plans, we headed for the World Trade Center Ground Zero site. It is possible to get to Ground Zero via bus and subway. The hotel sells the MetroCard, so we purchased them there and took the hotel shuttle back to the airport. From there, we took the M60 bus to the Astoria Blvd subway station where we took the N train to Canal Streeet. Note that on weekends, the W train doesn't operate, so it's necessary to go this route and then walk a few blocks to the WTC site. There are obviously many things to do in the New York City area. You might be wondering why we chose to go to what will become the site of the Freedom Tower, a memorial to the World Trade Center disaster. For us, it seemed very fitting because Sepember 11, 2001 was our 25th Wedding Anniversary and we were on a NCL cruise in Europe. We learned about the terrorist attacks while in Paris, France. Most of the passengers on our cruise were from the New York City area, since the cruise was a Trans-Atlantic crossing which had been scheduled to arrive in New York at the conclusion of the cruise. As the mural on the Firehouse wall says, "May We Never Forget". Visiting the site was a very moving experience for us. Before then we had only seen pictures on TV and in print. Seeing it in person gives one a different perspective. When visiting New York, I'd recommend this visit if you are so inclined. 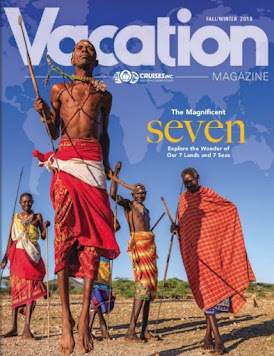 Additional pictures will be posted on our Cruise Vacations website once we have time to process them. We walked back towards the subway, stopping at City Hall Park before returning to our hotel. We got back to the hotel just in time because it started to rain while we were having dinner. The next morning we had breakfast, checked out of the hotel and had the Bell Captain call a limo for us to go to the pier. About 30 minutes later, we arrived at the pier, checked in, and got onto the ship. I'll continue from here in my next post. We've just returned from our 7 Night Bermuda cruise (round-trip New York) on NCL Dawn. We had a marvelous time which I can't wait to share with all of you. The next several posts will detail the various attractions we visited and provide a review of the NCL Dawn. Before doing so, however, I'd like to make a few suggestions to anyone planning a cruise vacation. As the post title suggests, one should plan for the unexpected in advance so that the situations I describe, should they occur to you, would not ruin your vacation or at the very least you would have assistance before, during, and after the vacation. If you've been watching the news lately, I'm sure you've watched in horror as flood waters washed homes away, houses were destroyed in minutes by tornados, and various other disasters that are going on across the world. We always like to think that this can't happen to us and hopefully that is the case. Unfortunately situations like these do occur and no one is exempt from the possibility. What does this have to do with cruising you might ask? Well, if that were your home, or if you lived in that neighborhood, odds are that you wouldn't be able to depart on schedule for your cruise. Several possibile situations come to mind from roads being blocked, airports being closed, flights delayed, family members injured during the storms. All of these would most likely prevent you from arriving in the cruise departure city prior to the ship sailing. I've said this many times before, but it bears repeating: Plan to arrive in the embarkation port the day before your cruise (domestic cruises) and at least the day before your cruise (overseas cruises). 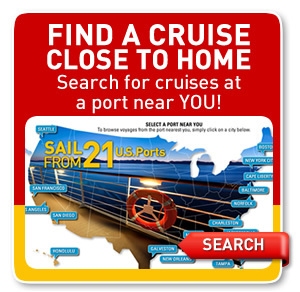 Assuming that you are flying to the embarkation city, you can either book airfare with the cruise line or on your own. In most cases, I suggest that my clients book on their own since they have full flexibility and can often save money (perhaps using frequent flier miles, or finding special pricing). I'm more than happy to assist them either way. That's not to say that you can't use frequent flier miles or get good prices through the cruise line, but you will have to make arrangements through the cruise line's "custom air" department. In some cases, there may be extra fees to tailor your flights to your schedule. The "non-custom" air arrangements typically arrive the day of the cruise which doesn't provide any room for delays. In our case, we arrived in New York the day before the cruise, so we didn't have any issues. However, our return trip was delayed 4 hours due to weather. Had that been the day of the cruise, we could have missed the ship (assuming it was on the same day as ship departure). In the above example, depending on the length of the delay and other factors, had you missed the ship your insurance may have provided assistance in rejoining the cruise or reimbursement for unused portion of the trip. If your house had been damaged or if a family member had ended up in the hospital, due to the storm as described above, the trip cancellation clause of the insurance policy may have come into play providing some financial relief. Insurance policies vary, so you need to read the policy and compare them to your needs. The following situation DID occur to one of the passengers on our cruise and we have been on many cruises where similar situations occured. The ship sailed on time, we had dinner and had gone to the welcome aboard show. The captain came on the loud speaker system and made an announcement. The ship was turning around and returning to New York because there was a medical emergency onboard. It was necessary to get closer to New York so that the passenger could be transferred to a hospital onshore. From what we can gather, the injury wasn't life threatening but it required medical attention that could best be provided in a hospital. The passenger was transferred from the ship to a hospital by the U.S. Coast Guard. A medical evacuation is a very expensive procedure - often costing tens of thousands of dollars. These costs are typically not covered by your personal health insurance policies and could have a very negative impact if you had to bear the cost yourself. I'm not trying to scare you out of booking a cruise. In fact, these situations I describe could happen any day and on any vacation. I hope that the cruise specialist, or other travel consultant that you work with, recommends insurance to you and that you seriously consider purchasing a policy. Besides the financial protection, there is the intangible benefit of having someone to turn to in the time of crisis. The majority of the policies available offer a 24 hour assistance line. I am writing this from the Internet Cafe onboard NCL Dawn. We sailed last Sunday from Manhattan Cruise Terminal (New York City) for a 7 night cruise to Bermuda. The weather was great and the cruise was terrific. We had two sea days before arriving at King's Wharf, Bermuda where we docked for two nights. On the third day in Bermuda, the ship relocated to Hamilton, Bermuda where we tendered. Some of the highlights were Crystal and Fantasy Caves, Helmet Diving, Fort Hamilton, Bermuda Underwater Exploration Institute, and the Aquarium. Come back in a couple days to start reading all about our trip. 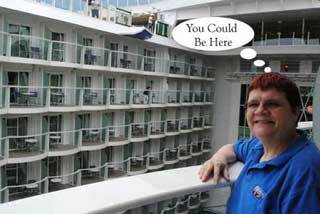 Each post, we'll take a closer look at the ship and the various attractions we saw. If you've not done a cruise to Bermuda yet, I'd suggest that as an alternative to the Caribbean as I've mentioned before. I'll have plenty of pictures to share with you and provide our impressions of the NCL Dawn. So, come back to read the entire story.